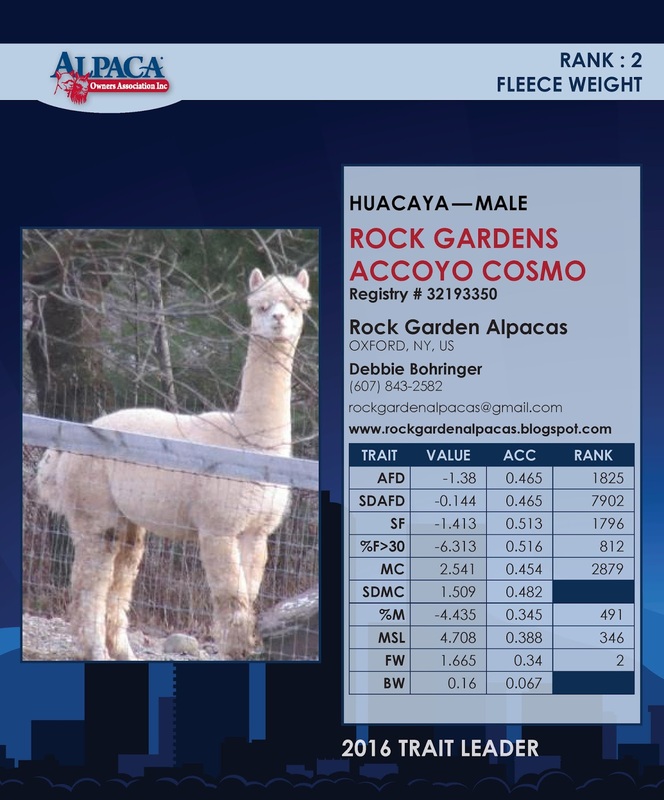 If you are looking to add some great genetics and fantastic fiber stats to your herd, this herdsire is for you! Cosmo has once again been named one of AOA's Top 5 EPD Trait Leaders for 2017 in fleece weight and will be featured in their presentation during the Alpaca Owners Association National Show and Auction in 2018; this is his third year in a row. 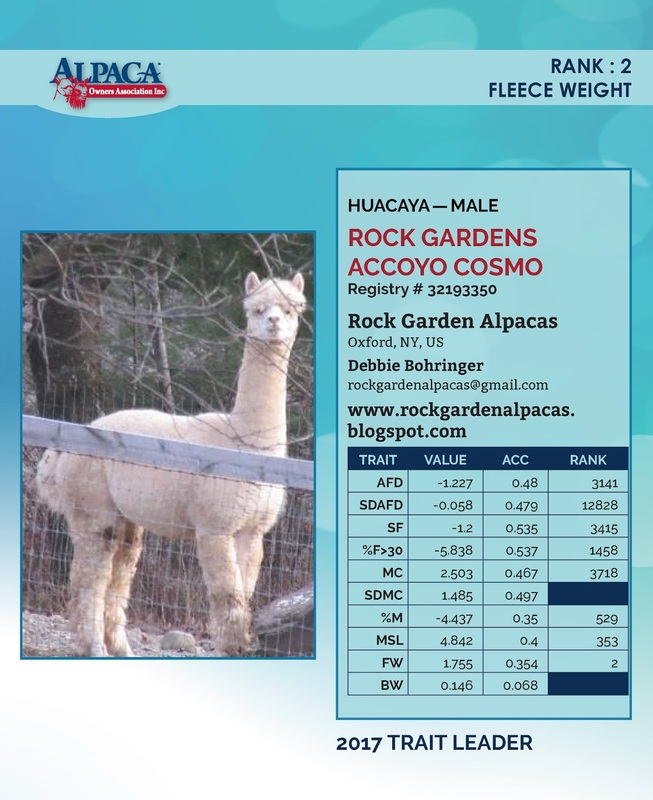 Cosmo is a Full Accoyo, white multiple ribbon winner with extremely heavy, crimpy, dense fleece with a staple length of 4 3/4 + inches. His fiber shearing weight averages 14 lbs with 7-8 lbs of it blanket (after skirting). It's in his genes to be a fantastic herdsire! His sire is SA Accoyo Invasion a Full Accoyo, beige who is the son of PPPeruvian Royal Fawn. 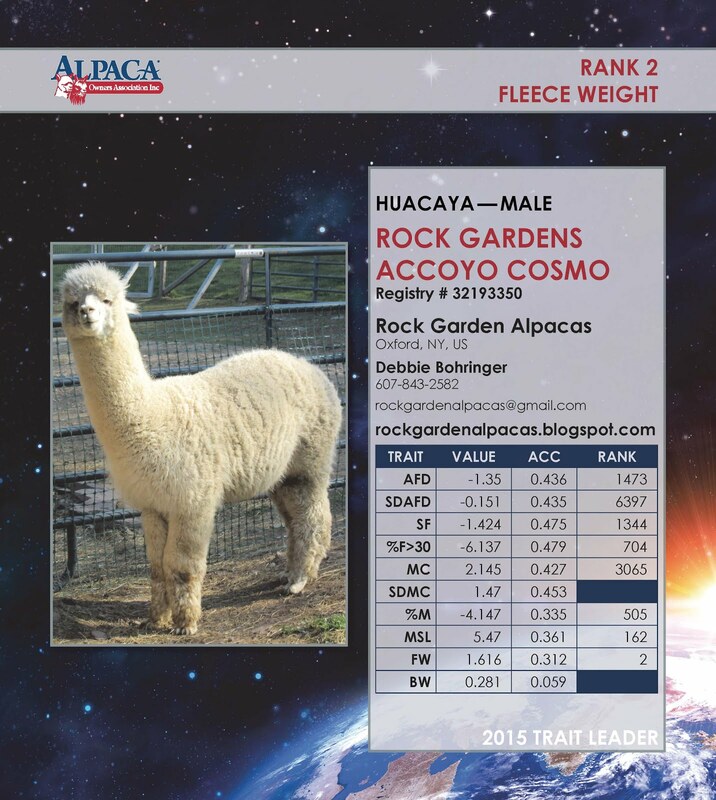 His dam is Alpavo’s Accoyo Sunflower Girl a Full Accoyo, white, whose sire was Accoyo Pinachi, adding a proven, yet rare Accoyo genetic to his pedigree. 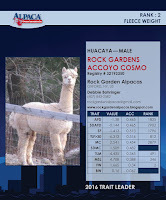 Pinachi was one of the best alpacas to come from one of the last imports from Peru in 1998. Personally selected by Julio Sumar for Derwydd Alpacas; Pinachi's fleece was super dense, bundled and crimpy with a high sheen. 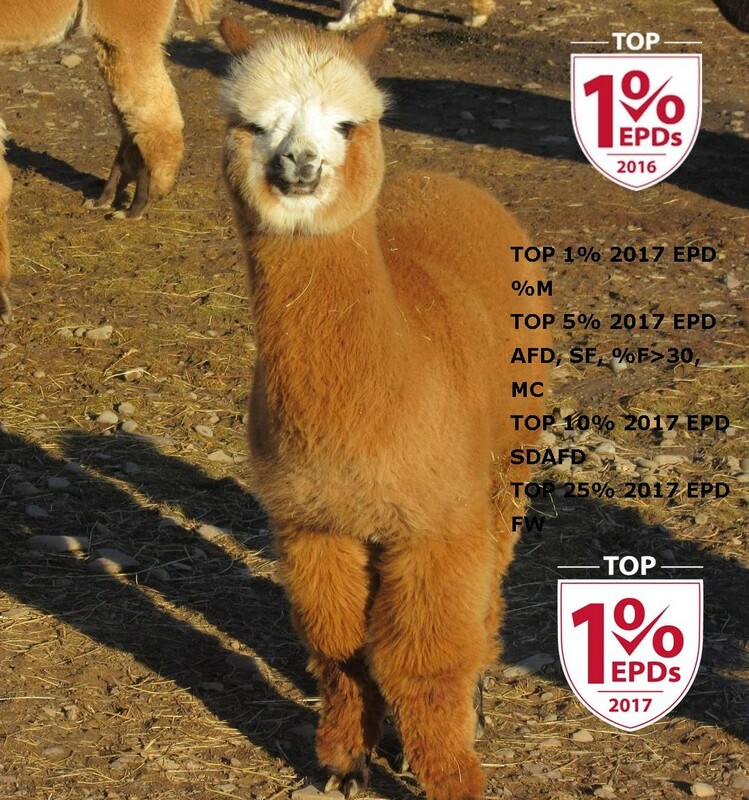 Pinachi died in 2007 from pneumonia and with only 38 cria on the ground, his incredible genetics are very rare, very sought after and can no longer be reproduced. Sunflower Girl was the very last cria sired by Pinachi. Sunflower's dam is Accoyo Mayflower, a Caligular and Vengador grandaughter who also has extraordinarily dense, crimpy, fine fleece. 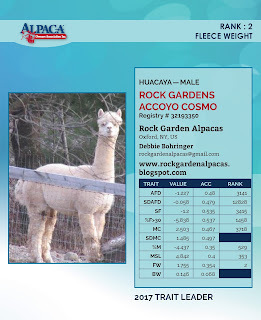 A beautiful alpaca with the elite fleece characteristics that high quality, well bred Accoyos are known for. Vengador was the son of Shere Khan, Don Julio Barredos most famous Accoyo herdsire and one that he viewed to be "the perfect alpaca". Sunflower has consistently placed within the Top 1% EPD Traits for MSL and FW and the Top 5% for %M since 2013. Cosmo started his breeding career in 2014. We bred him to our 2 girls, Ivy and Zinnia. 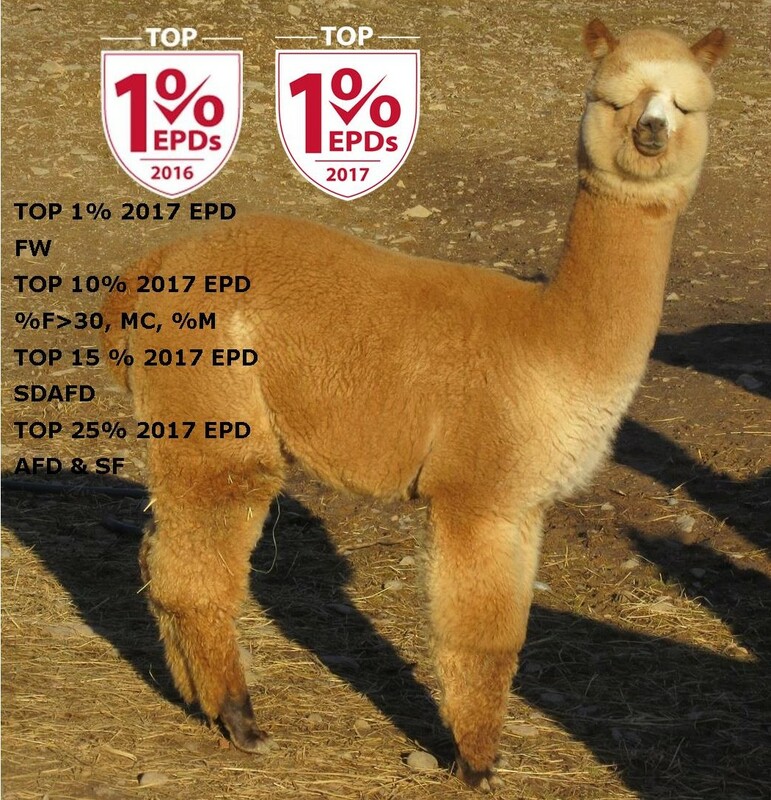 Ivy was also a Top 5 EPD Trait Leader in 2013 & 2015 for the Trait Standard Deviation of AFD and just missed by 1 in 2014. She has consistently placed in the Top 1-5% for AFD, SDAFD, SF, %F>30, MC and %M since 2013. This pairing produced a beautiful dark fawn girl with fine, long, crimpy, dense fleece exhibiting all the characteristics of both of her parents. We named her Rock Garden's Perucoyo Peony. Her 1st year fiber stats were fantastic! 18.5 microns, Standard Deviation 4.7, Coefficient 25.2%, Spin Fineness, 18.7, Fibers>30 1.9% with a comfort factor of 98.1%. She has placed in the Top 1-5% for AFD, SDAFD, SF, %F>30, MC, & %M & the Top 25% for FW since 2016. 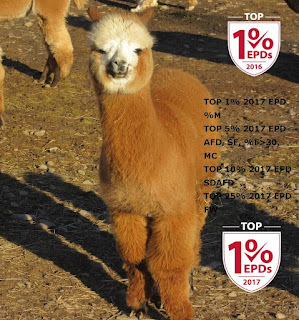 Zinnia is Ivy's 2011 cria who is a multiple ribbon winner who has consistently placed in the Top 1-15% for the traits of AFD, SDAFD, SF, %F>30 & MC since 2013. This pairing produced an exceptional medium fawn girl; we named Rock Garden's Perucoyo Gladiola, who has beautiful long, crimpy, dense fiber just like her father. Again we are pleased with her first year fiber stats. Micron of 21.3, Standard Deviation of 5.0, Co-efficient 23.3%, Spin Fineness 21.1, Fibers>30 4.9% with a comfort factor of 95.1%. She has placed in the Top 1% for FW, the Top 10-15% forSDAFD, %F>30,. MC, and %M %F>30, MC and %M since 2016. 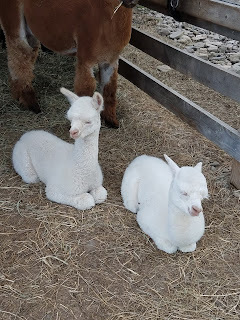 We had also bred Cosmo to our girl Petunia - who is Zinnia's daughter and Ivy's granddaughter, this pairing produced a very crimpy, dense, long fleeced little boy that we have named Digitalis (Digit for short). He appears to be a solid beige color at this time. Cosmo's breeding fee is $250.00 (drive-bys). Cosmo would love to breed to one of your girls - please visit our Openherd site for more info. 2nd Place 2013 American Fiber Rally - Fleece - Judge's remarks:"soft hand with nice brightness"